It came in the dead of the night—a rhythmic creaking sound that only the children could hear. Jackie and Johnny tried not to listen. But it called to them, whispering of evil, luring them into the darkness of the attic. 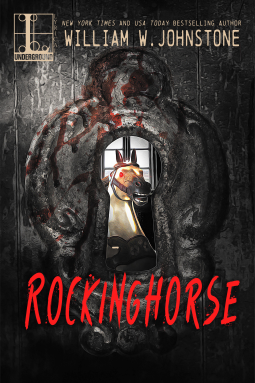 With its brightly colored saddle and painted-on eyes, it was the most beautiful rockinghorse Jackie and Johnny had ever seen. But as they took turns riding it, they didn't see its tail twitch or its lips curve into a terrifying grin. They couldn't hear the faint whicker that echoed among the shadows. They couldn't know that their own innocent eyes had taken on a strange new gleam. . .
To start with the premise is very misleading. In fact, I don't recall either child ever actually getting on the horse, nor were they lured into the attic by the horse. In fact - this story was just plain weird. For the most part, I found myself completely lost while reading it. Yes, there were moments of absolute gore, and a real battle of seemingly "good and evil", but the story as a whole just did not work for me. It also seemed to end on a cliffhanger leaving the reader to wonder just what happened. If there was no conclusion to the story - then what was the point of reading it? Just to read about people killing each other? Also, it was not mentioned that this story is actually a re-release of a story that came out in 1986 and therefore is NOT formatted for easy kindle reading. In fact, it would appear as though the pages of the original novel were scanned and then put together in ebook format. There was no way to enlarge the small text, and some of the pages were actually off center (the page itself seemingly tilted slightly to the side). Overall, I am certain that this book will appeal to those who enjoy a more "old school" horror novel. It did have its moments, but it just wasn't for me.